Libya's UN-backed prime minister has vowed to defend the capital Tripoli as forces loyal to a rival advance from the east. In a televised address, Fayez al-Serraj accused Gen Khalifa Haftar of launching a coup, saying his troops would be met with force. Gen Haftar's troops are on the outskirts of the city and say they have seized Tripoli's international airport. What has Mr Serraj said? In his address on TV, he warned of a "war without a winner". He said: "We have extended our hands towards peace but after the aggression that has taken place on the part of forces belonging to Haftar, he will find nothing but strength and firmness." 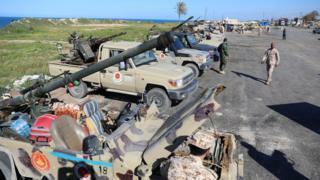 Gen Haftar ordered his forces to advance on Tripoli on Thursday. His Libyan National Army (LNA) forces have been carrying out a multi-pronged attack from the south and west of the city. However, forces loyal to Mr Serraj's Government of National Accord (GNA) have now slowed the advance. "Intensive air strikes" were carried out by GNA aircraft 50km (30 miles) south of Tripoli on Saturday. The LNA said it had seized the disused international airport south of the capital. US Africa Command, responsible for US military operations and liaison in Africa, said that due to the "increased unrest" it had relocated an unspecified contingent of US forces, but gave no further details. Tripoli residents have begun stocking up on food and fuel. The rogue general's defiance suggests that, despite international condemnation of his recent moves, he believes he can only secure a place in Libya's future political makeup through militarily means. Few thought he would go ahead and launch this operation - which he has long threatened to do - because they believed ongoing talks that saw him go from Paris to Palermo and the UAE for more than a year would buy time until a new political settlement was reached through negotiations and an eventual electoral process. UN envoy Ghassan Salame insisted the talks would go ahead, unless serious obstacles prevented it, saying "we won't give up this political work quickly". But Gen Haftar has said his troops will not stop until they have defeated "terrorism". The G7 group of major industrial nations has urged all parties "to immediately halt all military activity" and Russia has also called on parties to find an agreement.